John Kuhlmann Madsen, Nils Overgaard Andersen and Ingolf Thuesen eds. This anthology deals with the meaning of water and invites the reader to expand his knowledge of one of the most important issues in the Middle East. 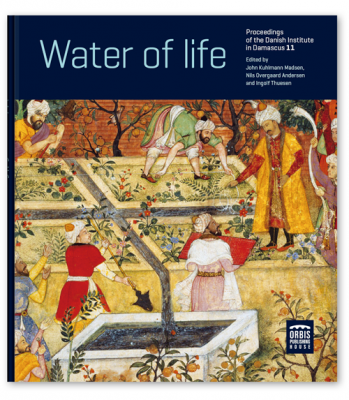 Scholars from the natural sciences and the humanities present new research in fifteen articles on the many aspects of the meaning and use of water in the Middle East, from the first human settlements until today. Water of life is both a metaphor and a harsh reality to life in the Middle East. In an arid region the access to sweet water is the recondition for any existence. The importance of water is obvious from the earliest written sources and archaeological finds. Both Sumerian mythology and the Bible introduce the extinction of life by a flood that would drown the entire earth. Thusly associated with both the beginning and the end of life, the role of water also became evident in the beautiful image of a paradise, a place where water generates harmony in life. The intention of this volume, in the series Proceeding of the Danish institute in Damascus, is to disseminate the knowledge on the Middle East. The book discusses the meaning of water in human history from the beginning with the early population during the stone age and ending with examples from contemporary life. a challenge due to harsh climatic and geological conditions. Scarcity as well as abundance of water may cause major challenges to human life. This book deals with a region of the world, which mostly consists of semi­arid or arid environments with little annual precipitation, which also includes some of the largest deserts in the world: the Middle East. Rain, in many areas, is unpredictable and may occur within a very limited time of the year. In addition, water is available from large rivers, most famously the Nile, the Euphrates and the Tigris, but is not immediately accessible for use. This double challenge resulted in the innovation of technologies to control the water in order to use it for consumption and subsistence. Following the development of farming, the discovery of irrigation technologies gave rise to urban settlements and empires. In the Middle East, the understanding of technologies to optimize the use of this valuable resource, became an important trigger of early civilization. Et forum for udveksling af kultur og viden mellem Danmark og den arabiske og muslimske verden.